RV Campgrounds in Florida aren’t all the same; their facilities are very much alike, but that is where the similarities end. If you’ve taken the RV challenge, packed yourself and your family and taken to the freedom of the open road, you’re looking for variety. When you choose to stop, you need a location filled with more than the normal facilities. You need a location with options. For anyone who doesn’t like to travel, an RV based vacation is ideal; you can take your environment with you and have all the comforts of home from door to door. Of course it’s not all about the journey. RV campgrounds vary in quality. A good one may not be the highlight of your vacation, but a bad one can spoil the trip for everyone. Every state has its own speciality, and in Florida it’s tourism. Florida is a state of contrasts: the bustle of Miami, the tropical heat of the Keys and the crowds around the Orlando Theme parks. Your dream may be a ‘get away from it all’ vacation, but would the other members of your family say the same thing? In Florida, you can have it all. There are many RV parks in Florida designed to cater to individual attractions; the space coast, Walt Disney World in Orlando, the Daytona International Speedway in famous Daytona Beach. What you need is one where you can pause your journey and relax, but where everyone can find something to enjoy without the huge expense of a hotel bill. At Tropical Resort and Marina you’ll find that ideal mix; efficient but friendly, back to nature but near the city, days filled with nothing to do, or spent racing round the latest attractions, the choice is yours. Visit a State park and say ‘hi’ to the local manatees or spend the day fishing while others in your party visit the Orlando theme parks, drop in on the Daytona races or try out skydiving. If none of those activities appeal to you, there’s the old world charm of DeLand and its tree lined streets, ideal for a spot of antique or souvenir shopping. If you think you’ve already seen the best RV camping in Florida, Tropical Resort & Marina may just surprise you! 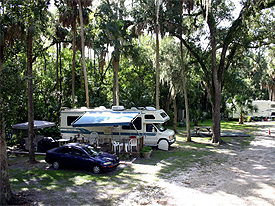 Looking for RV Campgrounds, FL? Look no further.